Glastonbury festival kicks off this week and just after a whole flurry of festivals will be following. 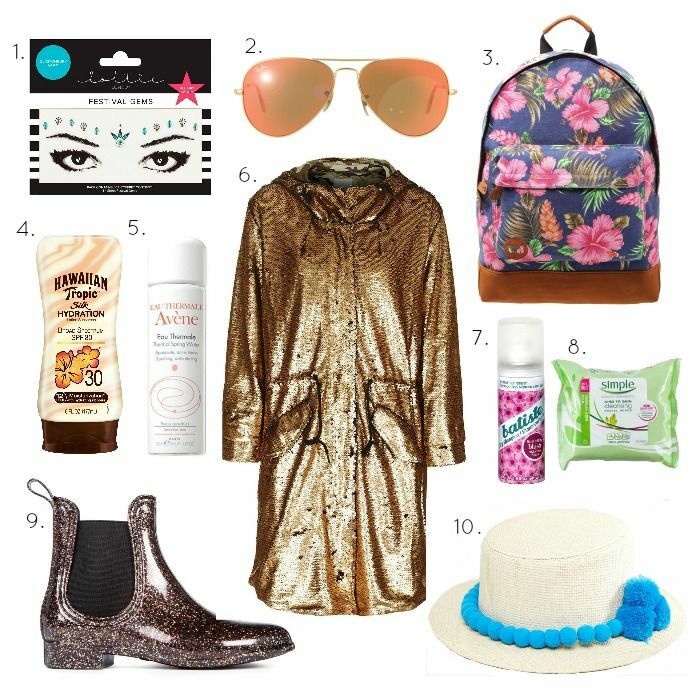 To make sure you are kitted out with the essentials, who doesn’t need a gold sequined parka? I’ve put together a quick fashion and beauty checklist to save you less time packing and more time looking fabulous. The perfect way to accessorize for a festival with these awesome gem. Just peel them off and stick them on for an easy an instant festival look. Everyone needs a pair of sunglasses, for hopefully sunny weather during your weekend festival. Rayban are classic and in this vibrant orange colour are perfect for summer. You’ll need a backpack to carry everything, or to save you going back to your tent and not to miss out on any music. I love the floral design on this Mi Pac which is now half-price in the sale. Don’t forget your sunscreen as being burnt is just not cool. Hawaiian Tropic is one of my favourite brands as it smells amazing and protects throughout the day. Don’t get overheated, if it’s hot it can make you feel faint or if you are stuck in crowds. Take a mini water spray like this one to spray throughout the day and also comes in handy for frizzy hair and washing your hands in those loos. A parka is practical, but when it’s sequin it’s just amazing. Be the envy of every festival goer in this sequin parka. Dry shampoo is not even an option. There is no ideal way to wash your hair at a festival – not that I know of anyway! So a bunch of festival styles, plaits and braids and dry shampoo is your friend. Similarly like dry shampoo a face wipe is so multi purpose. Use them for taking off make-up, cleaning your hands, taking marks off things….the list goes on! Wellies are great but glitter chelsea boots are even better. I love these boots and are easy to wipe clean after a muddy festival. I love an ASOS sale bargain and this hat is now £6 in the sale. Perfect for keeping your face in the shade and also has a fun festival vibe to it. Let me know what festivals you are off to this Summer, I’d love to hear?